Let your run shine a light! I have often pondered all the energy I use during a run: wouldn't it be great if I could channel it into electricity? For example: I would be running on a treadmill, which would provide energy for my tv! So if I stopped running I would miss my favorite programme. How is that for motivation?! A Dutch runner had the same thoughts and created a relay baton that gathers your energy! You take it with you during your run, and through the movement of your arms the baton gathers electricity. When you've finished your run, you plug your baton into a 'tree' which then lights up. 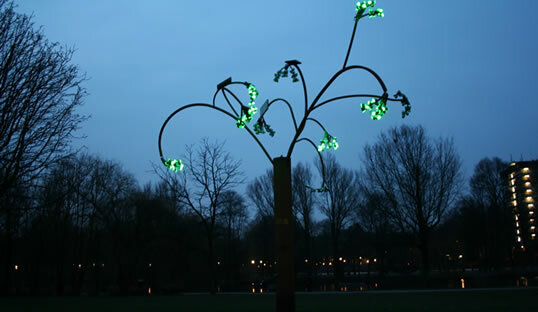 The tree is located in Amsterdam, and also 'runs' on solar energy. I wonder how much energy mothers would produce carrying the baton!